As mentioned, although disasters have negative effects on the health of affected populations, they also provide windows of opportunity to change obsolete structures and achieve sustainable development. Major disasters have offered the health sector of some countries in the Americas multiple opportunities for rehabilitation, rebuilding, and strengthening. Following are some examples. Hurricane Ivan hit the Caribbean island of Grenada on 7 September 2004. In light of the destruction caused, the international and local community responded jointly by establishing rehabilitation and reconstruction programs. In the health sector, 69% of the infrastructure was damaged. This ranged from minor damage to clinics to the complete destruction of hospitals. With technical support from PAHO, the Ministry of Health rapidly responded to the sector’s needs, and although the majority of its infrastructure had been damaged, the sector continued to provide service to the affected community, albeit in a limited way. By 2005, the entire infrastructure—with the exception of two health clinics and the destroyed hospital, which had not been rebuilt—had been repaired with the support of donors. In September 2005, the World Bank conducted an assessment of reconstruction and economic recovery one year after Hurricane Ivan and confirmed that although work was far from concluded, great progress had been achieved in rebuilding the country. Consult the USAID report from March 2005 for more information about the recovery process in Grenada. Learn more about the IFRC’s recovery efforts in Grenada. Hurricane Ivan badly damaged the Richmond Home for the Elderly—the only one of its kind remaining in Grenada. In addition to geriatric patients, the Richmond Home houses handicapped and psychiatric patients that require constant medical care. 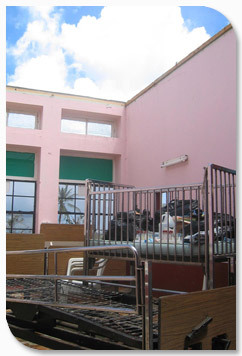 Following Hurricane Ivan, one patient died and those in the female ward had to be relocated with the male patients, resulting in overcrowding. Although temporary repairs were made to the Richmond Home, a tropical depression that struck Grenada several months later blew off the plastic sheeting that had served as the temporary roof. Once again, temporary repairs were made, but these proved no match to Hurricane Emily, which hit Grenada in July 2005. Since then, an estimated 25 patients have died, primarily due to infections related to poor hygiene, lack of water and exposure to rain. Seventy-five patients remain in the Richmond Home. Following Hurricane Emily, an engineering survey was conducted to identify the most urgent permanent repairs required, including appropriate mitigation measures to make the structure more resilient to future hurricanes. The governments of the U.S., Canada and Grenada contributed to this project and a check consultant was hired to supervise the repairs and ensure that mitigation measures were included. Repairs are underway to the roof of the main building and the buildings that house the matron and nurses’ quarters, the laundry facilities, electrical systems and other non-structural areas. The repairs should be completed by the start of the 2006 hurricane season. The Pacaya volcano in Guatemala erupted on 27 May 2010. Two days later (29-30 May 2010), tropical Storm Agatha struck the country, leaving 174 dead and 113 missing, more than 330,000 people affected, saturating the soil (a factor that takes on special importance since Agatha was the first storm of the 2010 season), and destroyed infrastructure. The country’s government led the PDNA in order to generate an accurate estimate of post-disaster and recovery needs. On the basis of the results, a reconstruction plan was launched with the principal objectives of achieving sustainable development and boosting the society’s ability to mitigate and adapt to the effects of climate change and thereby reduce vulnerability to socioeconomic, political, and institutional threats. See the assessment of sectoral damage and losses in a report by the Economic Commission for Latin American and the Caribbean (Spanish only). Read more about the PDNA process in Guatemala. The PDNA results focused on four main areas, with health included as a subprogram. The complete reconstruction calls for investment of US$1.921 billion. The Ministry of Health took the necessary measures to improve the level of disaster preparedness in the sector, such as preparing etters of agreement with important partners and reviewing its disaster response plan. The latter includes a study of lessons learned during the response to Hurricane Ivan. The new plan also stresses the importance of sensitizing the public to the hazards that the sector faces in disasters by disseminating relevant information. All projects to rebuild infrastructure were implemented in accord with safety and disaster-resistance standards.